Nokia Corporation brings to you the latest phone in their XpressMusic Series, the Nokia 5800 XpressMusic Touch Phone. Nokia 5800 XpressMusic is the 5th edition device in the S60 platform of Nokia which comes with an amazing touch display screen and innovative features. The user can input data by stylus or finger touch facility. The phone also supports features like a visual keypad and handwriting recognition for inputting text. Nokia 5800 XpressMusic has a brilliant display screen of 3.2 inches with 16 million colors and aspect ratio of 16:9 which adds more lively effect to photos and brightens the screen. On the home screen you can add shortcut icons for easy navigation to desired application. Nokia 5800 XpressMusic has an inbuilt accelerometer by which the phone automatically switches between landscape or portrait view. Nokia 5800 XpressMusic has an inbuilt Wireless connection facility by which you can connect it to any wireless router for easy access of internet. It also has a provision of Bluetooth and HSDPA (3.5G) for connectivity. 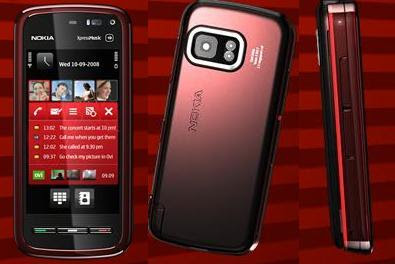 Nokia 5800 XpressMusic comes with a 3.2 Megapixel camera and uses Carl Zeiss lens for crisp clear image quality. The sharpness and the quality of pictures are much enhanced in Nokia 5800 XpressMusic as compared with other Nokia phones. The music player is advanced than other Nokia Music edition phones and has various options for balancing the sound. It also offers an exclusive FM radio support for podcasts. Nokia 5800 XpressMusic has a long 8.8 hours of battery life talk time in GSM mode and up to 5 hours of battery life in 3G mode. Also a power save facility is available to the Nokia 5800 XpressMusic which automatically blacks out the screen during a call when you touch the phone near your ears. The brightness is adjusted automatically according to the changing lighting environments around you this helps to retain your battery charge for a longer period. The amazing thing about this phone is that in spite of its high technical capabilities and advanced features it still its weights on 3.84 ounces. So, if you’re looking for a good MP3 player, excellent camera and advanced connectivity options then Nokia 5800 is the right pick for you. Thanks for your helpful suggestion robert. Overall..good value for your money. User friendly and gives gr8 video & pics quality. However does not live upto its XpressMusic tag as compared to my earlier Sony Ericsson music powerhorse. Also finds the firmware still not stable. If you are planning to buy it, would suggest you tos that causes the phone to crash and turnoff.